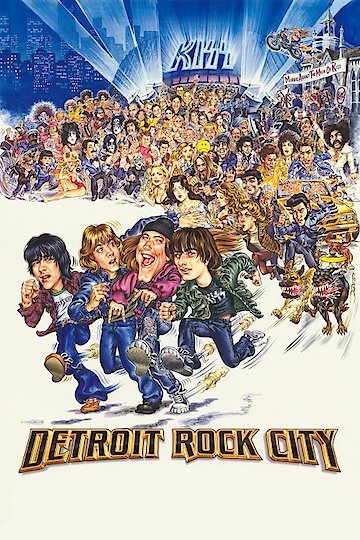 Detroit Rock City is a coming of age movie about 4 young teenagers who will stop at nothing to go to a concert where they will see their favorite music icons, KISS. The story of Hawk, Trip, Lex and Jam is not a new one, but its humor and lighthearted antics create an entertaining adventure as they journey to Detroit for the KISS concert. Along the way the boys must overcome obstacles and confront their own personal fears in order to achieve their goal. The film is set in 1978 in Cleveland, Ohio where the four boisterous and noisy boys attempt to pay tribute to KISS with their own band, Mystery. When the boys obtain tickets for KISS live, they believe their life is headed in the direction they want. Jams mother however, destroys the tickets believing them to be in Satans service. In response the four teenagers head to Detroit believing they had won the tickets through a radio show instead. After finding out that the tickets had been given to somebody else each of the boys separate in order to find a way into the concert. Eventually their naive scams or plans inadvertently work to their advantage and they are able to see KISS. Detroit Rock City expresses the angst of teenagers not only during that time period, but in general. It focuses on the dreams they all have of becoming rock stars and validating that through KISS. Each of these boys must face some kind of a personal fear or demon which holds them back and eventually, through comedic pursuit, are successful. This film bombed at the box office, however after its release to DVD it became another cult classic for fans of the 1970's movies utilizing the same themes and pretense. Detroit Rock City is currently available to watch and stream, buy on demand at Amazon, Vudu, Google Play, FandangoNow, iTunes, YouTube VOD online.